Wright Chat :: View topic - Who were the "best" apprentices ? Who were the "best" apprentices ? I haven't seen this photo in years! Good, honest architecture stands the test of time and always trumps derivation, style, and a lack of original ideas. Not only is the Ludekens' living room terrific, but the original kitchen (remodeled out of existence) was one of the best rooms of the century. The same owners who redid the kitchen, also replaced the marvelous concrete-walled bath with wood sinks with wall paper and standard fixtures, and took out the massive eucalyptus from the court to make room for a hot tub. Nothing good lasts forever. But I would say that Hillmer ranks with the best of FLW's apprentices. Fine Homebuilding published an illustrated article on the house some years ago, with a cutaway perspective showing construction of the diamond-section roof elements, and a list of the finish materials, among other things. The magazine has favored us at other times with similar articles on Lautner's early Mauer house, and on John Schweikher's interesting tin-roofed barn of a retirement home in the Southwest. Here's some of Mr Parker's own work, following a portrait, again in photos by Ezra Stoller. The material palette is rich, with block or stone and wood; some of the interiors are highly developed. SDR, the Parker houses are wonderful. Unfortunately, the off-center A-frame, third from the top, was demolished. 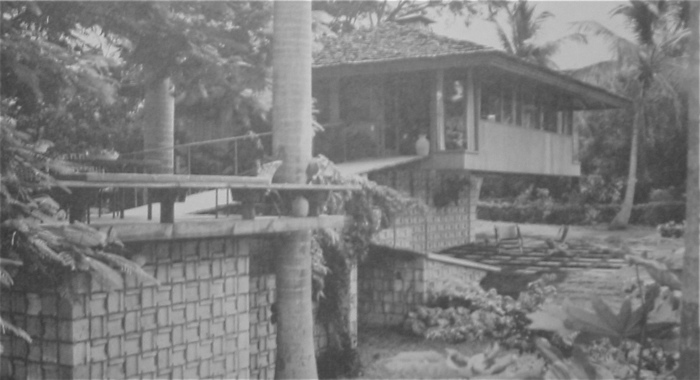 In TnGuy's second link, there is an interior of that house showing the staircase. Great building. The top and bottom photos on SDR's post are of Parker's own house. He later built an even grander place, which was a HB Pacesetter. TnGuy, I have the book that the second of your links shows. A test: can you name the Aaron Green design in that lot of photos? It was a great house in West Hollywood on Kings Road just up the street from Schindler's home and studio. The owner dismissed attempts to save it, had it demolished and replaced with an apartment building. Well, the room with fireplace, green superstructure and yellow (?) ceiling is Aaron Green. Is THAT the Kings Road house ? This elusive beast has been mentioned tantalizingly once before, on another site, with no satisfactory resolution. Thanks for the hint. There is a sequence of half a dozen shots of Mr Parker's own house, from the ground to the roof-top gloriette/studio, in "You and Architecture." Thanks for the links, TnGuy. There's some treasure in there. So glad most of the Hillmer material appeared intact. . . or in tact, as they are saying now ! Mr. Grant, that would be the former Reif Residence by My Leibermeister, Aaron the Great, correct? I don't know the name of the client, but it is the fifth picture in the series, the one with the huge fireplace. But the color scheme is not green and yellow. The fireplace is natural brick of a golden hue, and the ceiling is unfinished wood. It is one of Aaron's finest works, but that didn't stop the owner from demolishing it. That was the fate of the entire street, once home to some very impressive houses, now just apartments and condos. The Dodge house by Irving Gill was just a couple lots to the north. I'm not sure of the relationship to David Dodge, but it was the same family. The saving grace of the loss of the Dodge house is that it spurred the creation of the Los Angeles Conservancy, which has put a stop to that sort of uncivilized behavior ... more or less. Yes, that is indeed the former Reif House, I thought it burned down. 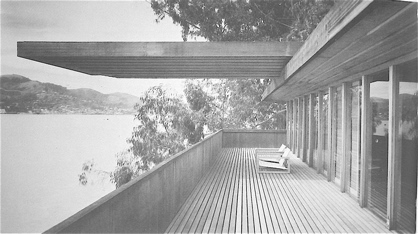 Another AGG house south, is the Anderson Residence in Malibu, on the ocean. Do not know the status. I sure miss Aaron, a book about him is in the works. I am working on an article about my time with Aaron for the revamped Fellows Journal. 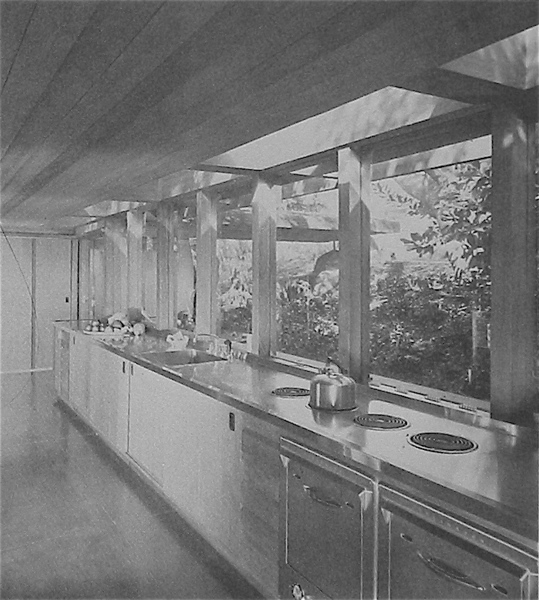 The Reif House was featured in House and Home in 1957, same pics, as H.B. not surprising do to the Gordon / Norcross marriage. 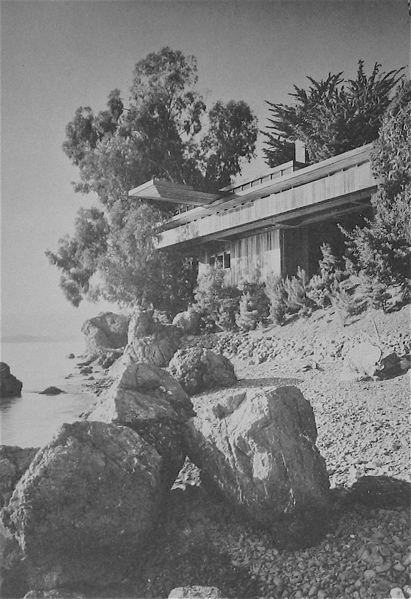 I don't know about a Malibu house by Aaron, but there is no mention of it in the Gebhard/Winter Los Angeles guide. But then they also did not include a Green house in, I believe, La Ca�ada-Flintridge, which, when I saw it, was in mint condition. 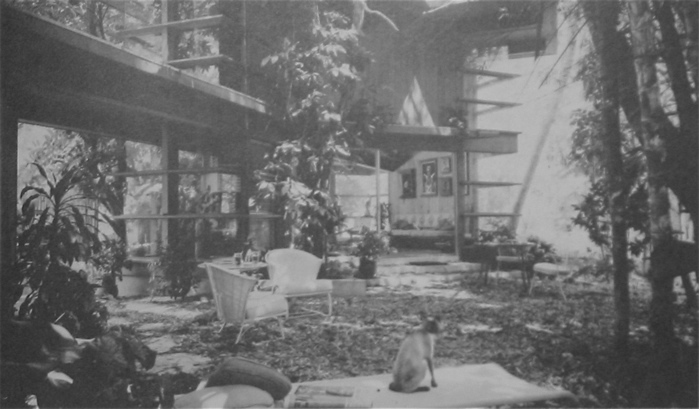 My favorite Green house is Bartholomew, featured in the October 1959 issue of HB devoted to FLW, page 214. Where is that? It looks like Woodside, but there is no reference to the locale. If I had the scratch, that's one house I would love to own. The Bartolomew house is in Los Altos Hills. It was for sale last year for 3.8 million. While much of the original home is intact, it has been enlarged greatly by former apprentices Bill Patrick and Dan Liebermann. As originally built, yes it was quite dramatic for its size, also one of my favorites. 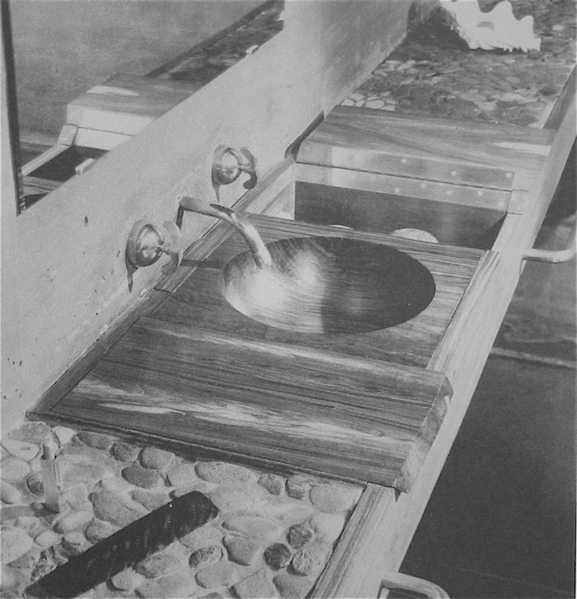 One of Aarons first projects when he and Wright opened the S.F. digs, the Paul Residence is still my fave. The Pauls are in their 90's and still live there, everything in place as seen in the House Beautiful. About the only thing they have changed is perhaps the lightbulbs. The Bartholomew and Paul houses are perfect examples of extraordinary spaces that may be created in a very small house, using Wrightian principles. They also show the importance of the landscape around the house as an extension of living space. Has the Paul floor plan been published, or would anyone have it to share? They all fall into the category 3 noted above. I think also Jorn Utzon spent time at Taliesin before doing his great work, but I haven't found confirmation of him attending and studying with Wright. I also like Wallace Cunningham's work (category D above). 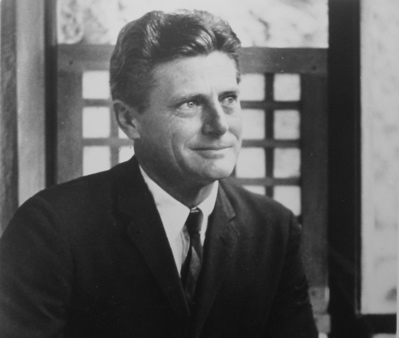 Someone else mentioned William Bernoudy of St. Louis. Good ideas, Mr Hawker. Welcome to you ! I'd certainly like to see more of Paul http://www.agaarchitects.com/pages/residential/single_family/res_paul.html and more of the work of the archtitects that M Hawker and others have mentioned. Nari Gandhi has escaped me completely. Sausalito Fellow Barry Peterson has a links page http://www.deliberate-design.net/art_and_architectural_links.htm on his site http://www.deliberate-design.net/ with a Northern California Taliesin Fellows page. Dan Liebermann's fascinating work isn't there but I've seen it previously, I think. Barry ?